TGV (Telescope Germanium Vertical) is the measurement of double beta decay of 48Ca and 106Cd. 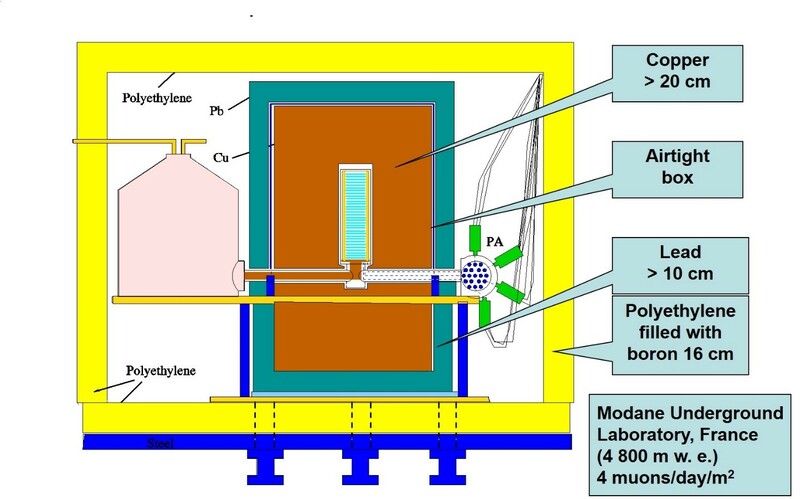 The TGV collaboration (IEAP CTU, JINR Dubna, CSNSM Orsay, CU in Bratislava, NPI CAS) has been interested in experimental investigation of the ββ decay for several years. The collaboration measured half-live of two-neutrino double beta decay of 48Ca isotope with the TGV I detector. Based on the experience with the spectrometer TGV I, the more efficient low-background spectrometer TGV II was constructed. The most important feature of the TGV II is its ability to study small amount of materials with high efficiency (especially samples made of isotopes available only in small quantities, e.g. 106Cd). At present the collaboration TGV is devoted to the investigation of the two-neutrino double electron capture (2νEC/EC) in 106Cd. The Phase II of this measurement started in December 2007 with appr. 13 g of 106Cd. 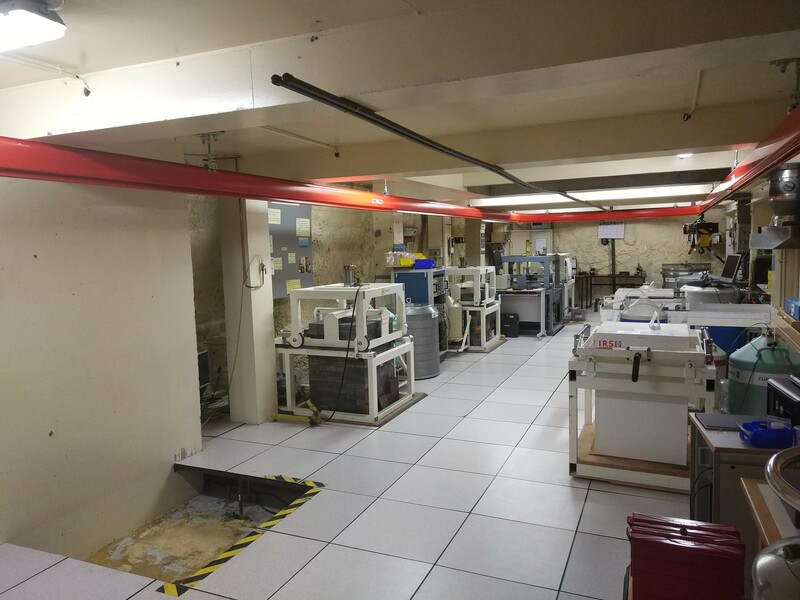 The result of T1/2 ≥ 3.7 x 1020 years for 2νEC/EC (g.s → g.s) decay of 106Cd has been found after the processing of experimental data obtained after 8 700 hours (1 year) of measuring time. New run (the phase III of the TGV experiment) with 106Cd foils with enrichment of 99.57 % and total mass of ~ 23.2 g was started in February 2014. 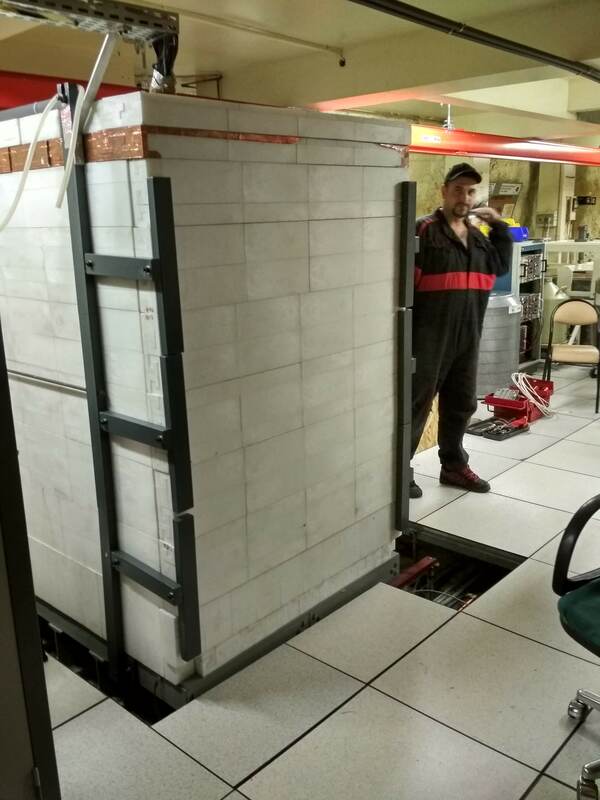 On the break of May and June this year (2018), a business trip to LSM (Modane, France) has been conducted, where four people from IEAP institute joined a three person team from JINR institute in Dubna, with a goal of moving the TGV detector from its original position (a special room dedicated solely to TGV within LSM laboratory) to a new location, in a neighboring room. The TGV, which all together weighs 10 tons had to be moved by hand, as no heavy machinery can be used for such job. Fig. 2 Pictures showing the room where the TGV was moved to. On the left, the room before installing TGV. On the right, the room after TGV was installed. The two teams worked hard on disassembling every little (and big) piece of TGV - lead and copper bricks, polyethylene panels forming the shielding, steel frame which the detector stands on, electronics and the core of the detector (32 HPGe with 106Cd samples) itself. After moving 10 tons of raw materials on small piles, representing each layer of the detector, the time came to put everything back together, just the way it was, onto its new location. Four days after the first piece of TGV has been taken apart, the detector stands in its new spot within the walls of underground laboratory LSM. After a couple quick successful tests to find out whether everything works correctly, the business trip was concluded with a celebratory dinner at Fort Marie-Christine Restaurant in Aussois. We had this beautiful view. Fig. 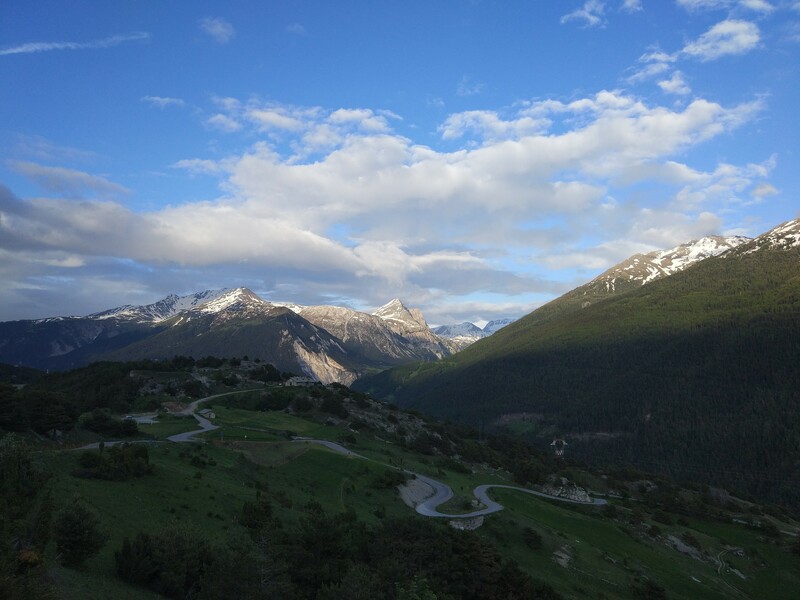 4 View from Fort Marie-Christine Restaurant in Aussois, France.